In 1985, American newspaper readers met an appalling little boy. He taunted his mother (“Prepare for annihilation, pitiful Earth female”), tormented a classmate by telling her he had brought a “thermos full of phlegm” for lunch and kept a sign on his bedroom door that read “Enter and die.” Millions fell in love with him. Running in hundreds of papers for the following decade, Bill Watterson ’s “Calvin and Hobbes” was not only the strangest American comic strip. 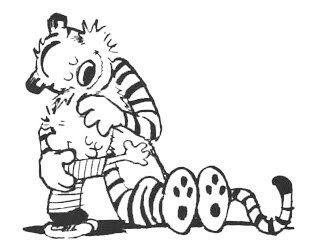 It was also the funniest, the most touching and the most profound. . . .
At its simplest level, the strip is about the friendship between a bright 6-year-old misfit (Calvin) and his pet tiger (Hobbes). Its “trick” is that Hobbes is a lifeless stuffed animal when others are present and a rollicking, witty companion when they are not. So the story can be understood on many levels. It is about the richness of the imagination, the subversiveness of creativity and the irreconcilability of private yearnings and worldly reality. Where Calvin sees a leaf-monster trying to swallow him, Calvin’s father sees his troublemaker son scattering the leaf-piles he has spent all afternoon raking. “Calvin and Hobbes” would have faced big challenges if Mr. Watterson had decided to carry on. The Internet has cut a swath through the press. There are no longer hundreds of independent newspapers to which a cartoonist can syndicate his work. And today’s cultural climate might have made it more difficult for him to render a boy’s imaginative life in a realistic way. Calvin fantasizes not just about dinosaurs flying F-14s but also about shooting up his school with a tank. At one point, he tells Susie Derkins—his neighbor, rival and secret crush—“I’m sure it’s frustrating knowing that men are bigger, stronger and better at abstract thought than women.” That these are all jokes matters little. Enforcers of taste are not known for their humor. So one feels a double nostalgia in looking back at Mr. Watterson’s cartoons—first for an artist who is probably the greatest his genre has produced, second for the culture he spoke from, which was in ways freer than our own. Of course, few of us would trade the Internet for a single daily cartoon strip, but one does feel a twinge of regret that speech codes and shrill denunciations have replaced common sense and acceptance of humorous intent. It almost makes one want to get in a tank and . . . oh, never mind.